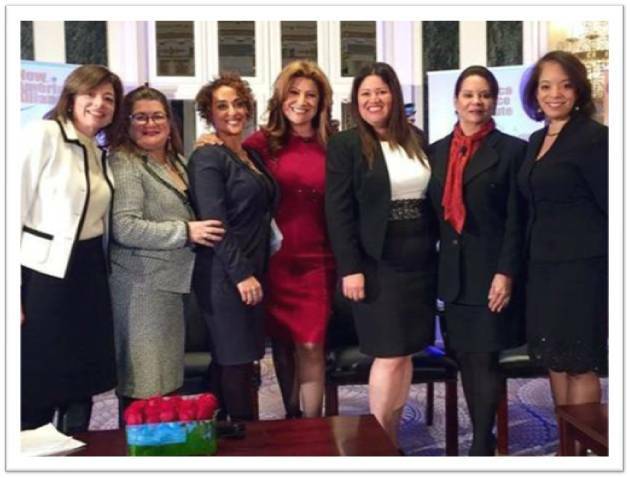 Under the title “American Latinas: Leadership and Economic Force” and for the first time, the New America Alliance (NAA) brought to the forefront an exclusive panel of powerful Latinas in recognition of the advances of Hispanic women in business. Opening remarks were addressed by Ana Maria Fernandez-Haar, NAA Institute Chair of the Board and Managing Partner at Victoriana LLC, who made a compelling overview of the milestones Latinas have conquered since NAA’s foundation. “Especially for U.S. Latinas, the future looks promising. Many of our NAA female founding members broke glass ceilings on their own,” she said. Additional remarks were conducted by Lorraine Cortez-Vazquez, Executive Vice President, Multicultural Markets & Engagement at AARP and Jorge Ferraez, NAA Board Member and Founder and Publisher of Latino Leaders’ Magazine. The panel showcased Latinas in key positions of the public and private sectors including The Hon. Alejandra Y. Castillo, National Director, Minority Business Development Agency at the US Department of Commerce; Alejandra Ceja, Executive Director, White House Initiative on Educational Excellence for Hispanics; Ana Maria Fernandez-Haar; Carmen Ortiz-McGhee, Senior VP and Resident Sales Director, Aon Risk Solutions, Capital Region; and Alice Rodriguez, Executive VP, Regional Sales and Executive –Business Banking at Chase. Moderator of the panel was Jackeline Cacho, NAA member and Founder, Finding Productions, who made a great introduction telling her personal story and recognizing the formidable headway Latino women are making in every industry. The morning panel was followed by the traditional U.S. Mayors Forum and Luncheon with the presence of The Hon. Pedro Segarra, City of Hartford, CT , The Hon. Angel Taveras, Mayor of Providence, RI and Mayor Elect of Providence, RI Jorge Elorza. Please click on any picture of our photo gallery to see some of the event highlights and share your thoughts on how NAA can increase the reach to Latinas around the country to boost their economic and political potential. Enjoy! Celebrating achievements for all Latinas!